In June 2013, Enafa, a longstanding member of the Bezà Mahafaly monitoring team, contributed to a field research program being led by Dr. Josia Razafindramanana. 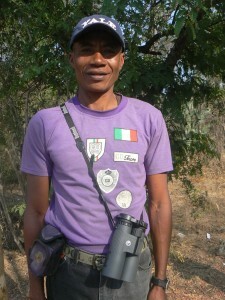 Dr. Razafindramanana’s research focuses on the lemur population of Dabolava, near Morondava. Enafa expertly helped capture lemurs in the field with a blowgun. Enafa is widely recognized by researchers in Madagascar as one of the best skilled specialists in lemur capture, and has worked with several other research programs to this effect.